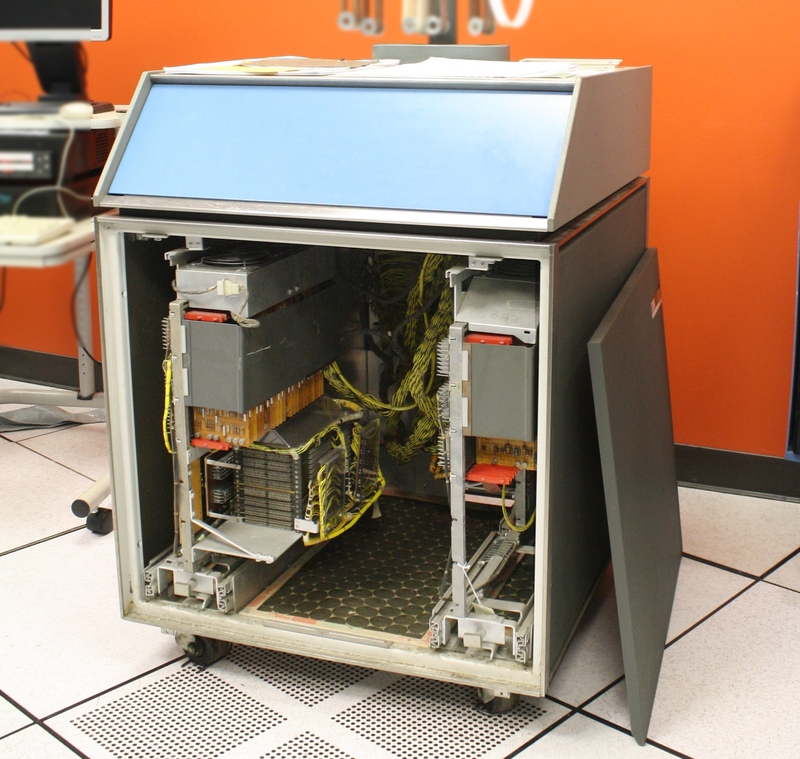 A view inside the IBM 1406 Storage Unit, which provides 12,000 characters of storage for the IBM 1401 mainframe. At the left is the 8,000 character core module below the cards that control it. 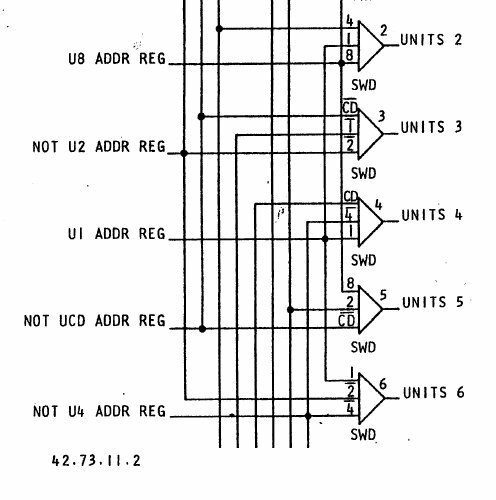 The 1406 contains two separate core memory modules: one with 8,000 characters and one with 4,000 characters. In the picture above, the 8K core module is visible on the left, while the 4K core module is out of sight at the back right. 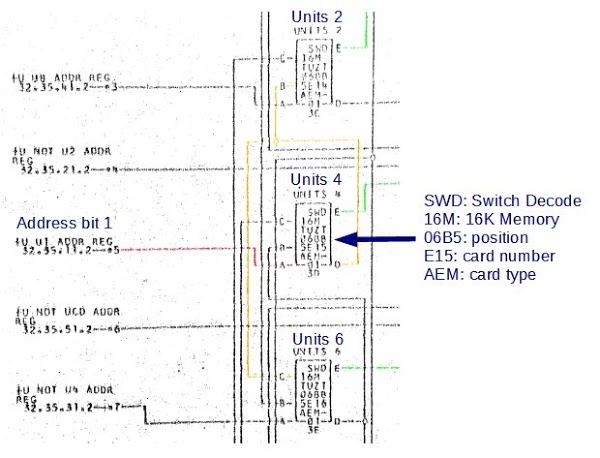 Associated with each core module is circuitry to decode addresses, drive the core module, and amplify signals from the module; these circuits are in three rows of cards above each module. 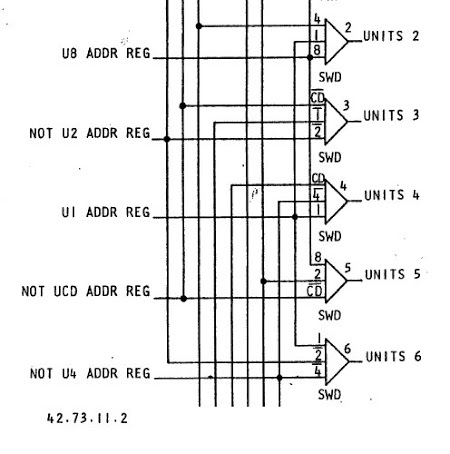 The 1406 also provided an additional machine opcode (Modify Address) for handling extended addresses. Surprisingly, the logic for this new opcode is implemented in the external 1406 box (the cards on the right), not in the 1401 computer itself. The 1406 box also contains hardware to dump the entire contents of memory to the line printer, performing a core dump. 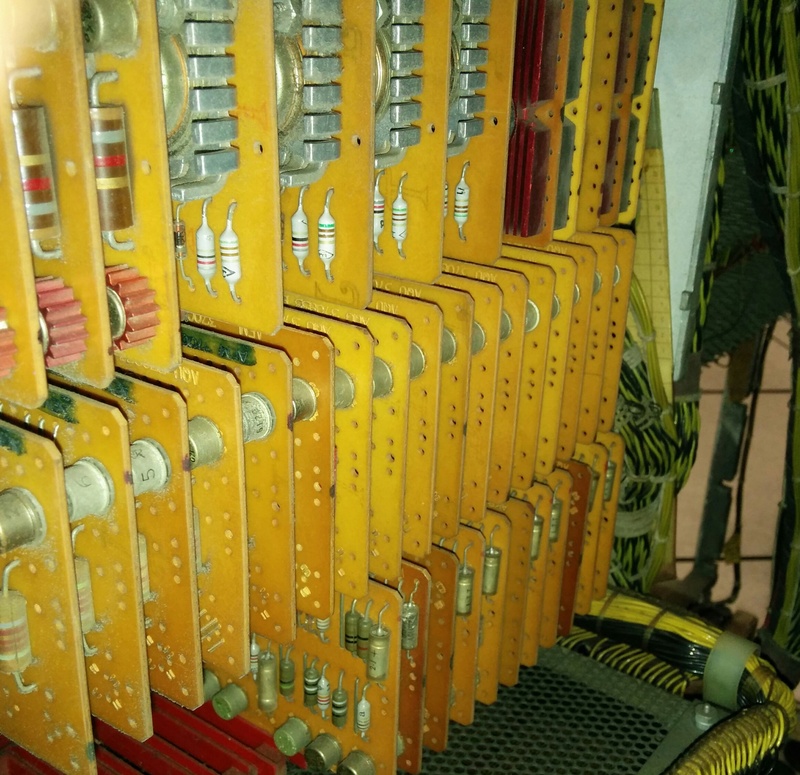 A closeup of SMS cards inside an IBM 1406 Storage Unit. The top cards have heat sinks on high-current driver transistors. 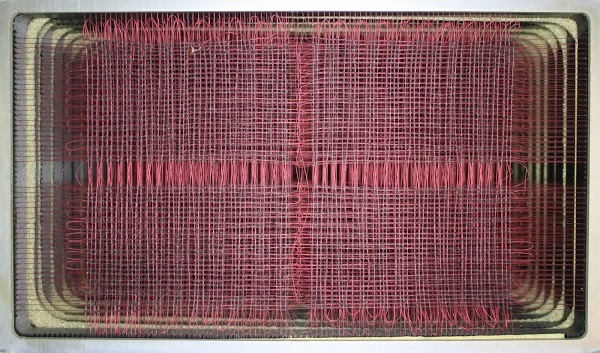 The core memory is made from planes of 4,000 cores, as seen below. 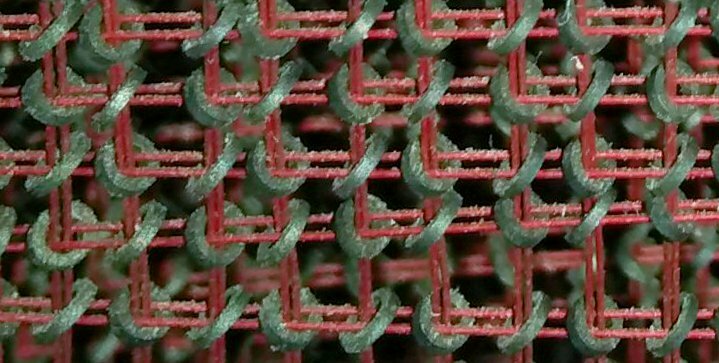 Each plane is built from a grid of 50 by 80 wires, with cores where the wires cross. By simultaneously energizing one of the 50 horizontal (X) wires and one of the 80 vertical (Y) wires, the core at the intersection of the two wires is selected. Each plane holds one bit of each character, so 8 planes are stacked to hold a full character. 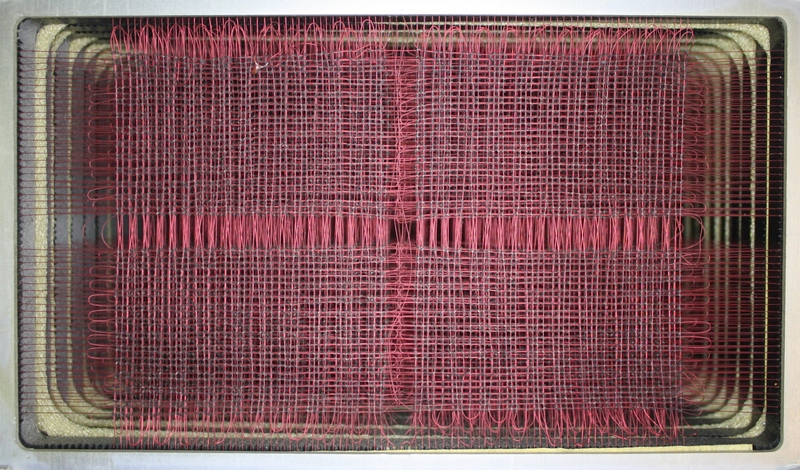 Core memory in the IBM 1401 mainframe. 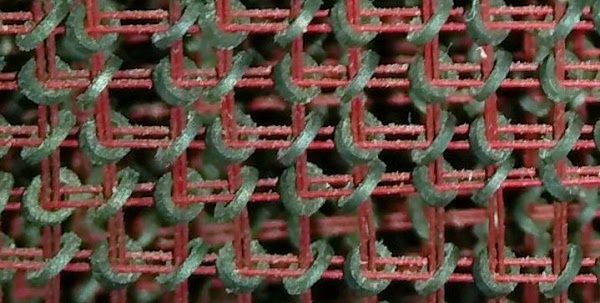 Each layer (plane) has 4,000 tiny cores in an 80x50 grid. Multiple planes are stacked to form the memory. 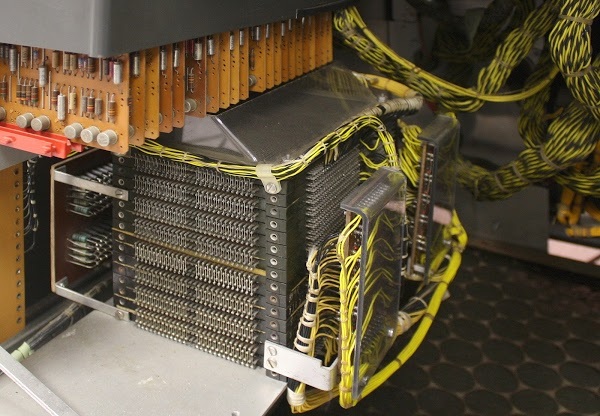 The photo below shows the 8K memory module inside the 1406, built from a stack of 16 core planes. (Since a stack of 8 planes makes 4K, 16 planes make 8K.) 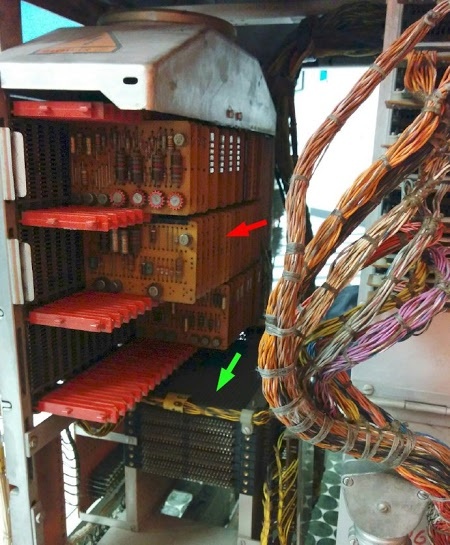 Mounted on the right of the core module are the "matrix switches", which drive the X and Y select lines; my previous core memory article explains them. I though this was a brilliant debug. Stan, our experimentalist extraordinaire, had helped considerably by testing the machine over several days and narrowing the fault to this 4k block of memory and noticing the particular address pattern. I was already busy at the back re-reading the address decoding section of your previous core memory blog post... We all said "we wish Ken was here" as we walked towards the machine room, ready for an arduous session of deciphering the "nearly incomprehensible" ALDs. And there you were! You found the faulty card in maybe 10 minutes, using only the power of logic. Usually we use the power of the oscilloscope, the power of trial and error, and the power of arguing around a cup of coffee a lot more. Your in-depth knowledge and detailed reverse engineering of the core memory system paid of big time. It's an asset to have you around! If you have the time, check this video. The opening melody is played by an IBM 1401. Aside from contact corrosion I would consider checking those 50 year old electrolytic capacitors. The very first machine I ever programmed. An absolute joy. The amount of work this machine could do in just a couple of K (mine had 8) was astonishing, and no matter how tightly you packed your code in, there was always a way to fit more in. My English is too weak to express the storm of emotions. The article is excellent, of course. And those old computers are simply marvelous! I found this thrilling. Seriously. What a great story you've shared and I am in awe of your skills in this arena. Also the first machine I ever programmed! As a high school junior in 1972. I still have card decks for some of the FORTRAN IV assignments, and even have a sheet of "coding paper" that let you fill in formatted card data before sitting down at a card-punch. I'm still programming today, 43 years later, mainly in C/C++ and Python. Most Fun Ever. And Hour of Code let's me help pass the joy on to yet another generation. Thanks so much for your blog... I found it googling Images... I was given a 1401 core memory 30+ years ago, but the donor didn't know what it came from. I have exhibited it at tech fairs, asked every expert I know... and finally today discovered it's identity courtesy of your blog. Thanks! Thank You--what a fun trip back to "the day". my hands on anything this old-skool-cool. I went to work for IBM in 1967 which was too late to be trained and work on the 1401. I did uninstall a few. I spent lots of time on System 360 and System 370 and associated hardware. Do you need any 108 driver transistors for those tape drives? I have a few if I can find them. Hi Bill! The 1401 team is always happy to have more spare parts if you have 108 transistors lying around. There's contact information at http://ibm-1401.info/ if you want to email or call them. Sounds like a normal day back in the early 60s. The fun part was running your finger down the diodes to find the hot one. I spent a few years on shipboard tending Univac 1206 and related Collins Radio gear in the late 60's. 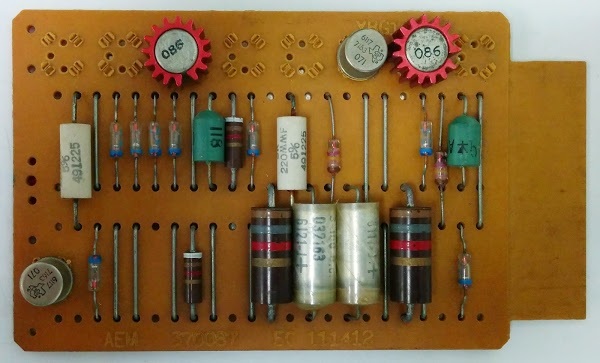 Similar resistor transistor logic cards, a few thousand 30 bit words of core memory, and 1/2 inch magnetic tape for external storage. In 3 years we experienced one failure, a logic gate in the ALU. The machines were water cooled, massive things, the logic and memory mounted in heavy shelves that took two men to remove. The front panel display consisted of tiny combination lamp/pushbuttons that glowed orange, I think they were neon. The Naval Tactical Data System. My special charge was maintaining Collins data transmission switches which converted those 30 bit words into a set of 8 phase shifted analog frequencies, which could be superimposed on an AM radio signal for ship to ship communication. More Collins radio gear did the sending and receiving. 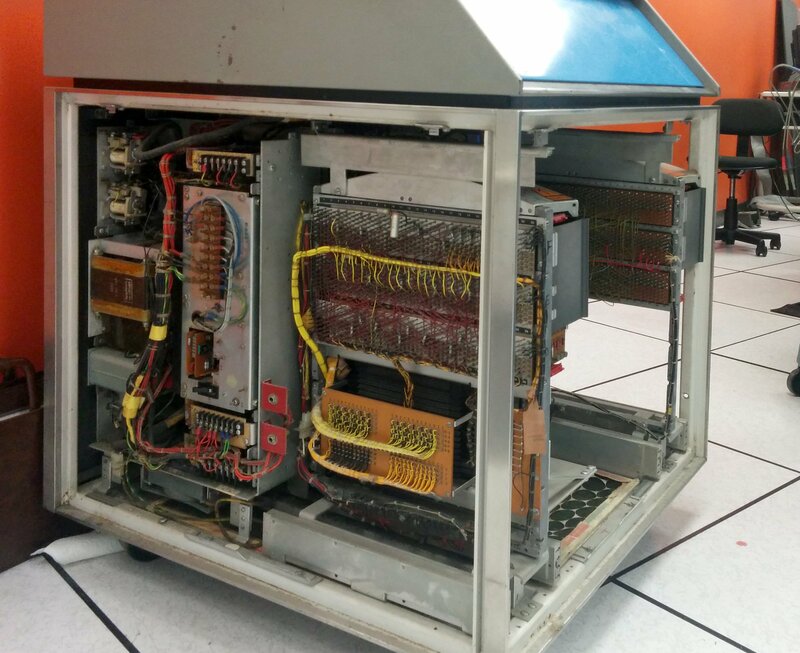 Later we had some Univac 1218's with actual MSI chips. Nice read. Brought me back to my days as a IBM Customer Engineer in 1960s London. I looked after a 1401 in-house at the IBM data centre and another for Export Credit, who did all their work on a 8k machine. On one memorable occasion, on closing the back gate of the 1402 card reader, the gate shorted the main power cables where the insulation had decayed. This blew the gate off and sent me crashing across the room to be stopped by the glass on the 14th Flr. window. Memories! I am a 22 year old physics student with a (still technically undeclared) minor in computer science, and I find this whole concept fascinating. 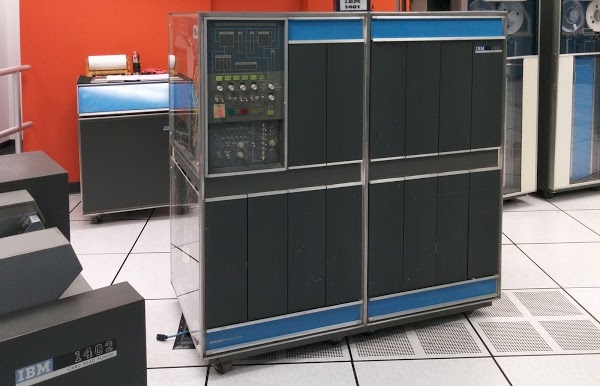 Not just this specific blog post, but the whole idea of not only preserving the history of computing, but also actually running the machines. I have always liked the idea of running obsolete tech. I mean, it may be out of date, and sure, modern machines can do it orders of magnitude faster, but the old stuff still works. Im glad that this kind of stuff is being preserved.